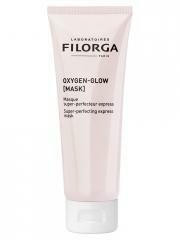 Filorga Oxygen-Glow [Mask] 75ml is a super-perfecting express mask recommended to smooth, even, plump and detoxify the skin. It is ideal for dull complexion, uneven skin texture, dehydrated skin, fine lines or lack of uniformity. 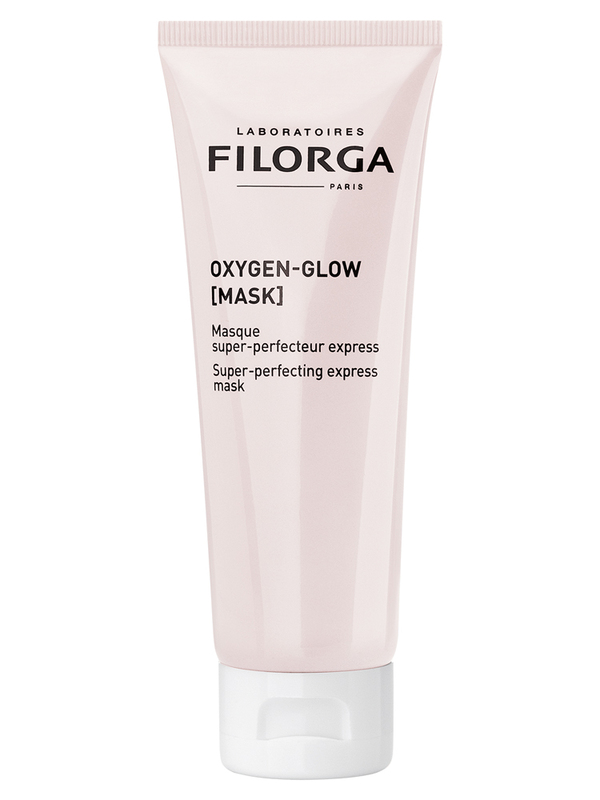 This mask removes defects in real time and boosts the radiance instantly for a beautiful natural skin in 10 minutes. The Super-Skin Boosting Factors complex combines an energizing oxygenation booster, plumping and smoothing hyaluronic acid and detoxifying L-enzyme to reveal zero defect skin day after day. The immediate radiance of the skin is visible to the naked eye. The hydra-illumination texture integrates the Photoperfector HD technology for an instant sublimated skin effect. Apply the mask in a generous layer on clean and dry skin, on the whole face, neck and décolleté. Leave on for 10 minutes. Remove with a damp cotton. Use one to three times a week. Can also be used daily in cure of 7 days for an intense super perfector effect. Indication: To smooth, even, plump and detoxify the skin. Aqua (Water), Glycerin, Propanediol, Synthetic Fluorphlogopite, Prunus Amygdalus Dulcis (Sweet Almond) Oil, Gluconolactone, Glyceryl Stearate, Peg-100 Stearate, CI 77891 Tiitanium Dioxide), Arachidyl Alcohol, Ammonium Acryloyldimethyltaurate / Vp Copolymer, Octyldodecanol, Cetyl Alcohol, Behenyl Alcohol, Cera Alba (Beeswax, Beeswax), Phenoxyethanol, Sodium Hydroxide, Hydrolyzed Lupine Protein, Arachidyl Glucoside, Perfume (Fragrance), Ethylhexyl Salicylate, Chlorphenesin, Tin Oxide, Sodium Hyaluronate, Xanthan Gum, Citrus Paradisi (Grapefruit) Fruit Extract, Propaeolum Majus Flower / Leaf / Stem Extract, Hydrogenated Polydecene, Butyl Methoxydibenzoylmethane, Tocopherol, Helianthus Annuus (Sunflower) Seed Oil, Sucrose Palmitate, Diethylhexyl Syringylidenemalonate, Hydroxystearic Acid, Papain, Citric Acid, Alumina, Glyceryl Linoleate, Sodium Chloride, 1,2-Hexanediol, Caprylyl Glycol, Carbomer, Ethylhexyglycerin, Folic Acid, Algin, CI 17200 (Red 33), Glucose, Potassium Chloride, Sup Dismutase, Potassium Sorbate, Calcium Chloride, Magnesium Sulfate, Glutamine, Sodium Phosphate, Ascorbic Acid, Sodium Acetate, Lysine Hcl, Arginine HCl, Alanine, Histidine Hcl, Valine, Leucine, Threonine, Isoleucine, Tryptophan, Phenylalanine, Tyrosine, Glycine, Polysorbate 80, Serine, Cystine, Cyanocobalamin, Glutathione, Asparagine, Aspartic Acid, Ornithine Hcl, Glutamic Acid, Nicotinamide Adenine Dinucleotide, Proline, Methionine, Taurine, Hydroxyproline, Glucosamine Hcl, Coenzyme a, Sodium Glucuronate, Thiamine Diphosphate, Retinyl Acetate, Inositol , Niacin, Niacinamide, Pyridoxine Hcl, Biotin, Calcium Pantothenate, Riboflavin, Sodium Tocopheryl Phosphate, Thiamine Hcl.